As mentioned above, the OnePlus 5 launch time is 12pm EDT (9:30pm IST), and the event will be live-streamed from the official US website. OnePlus is organising a pop-up event on June 20 in New York, while similar pop-up events will be hosted in Paris, Amsterdam, Copenhagen, and Berlin on Wednesday. 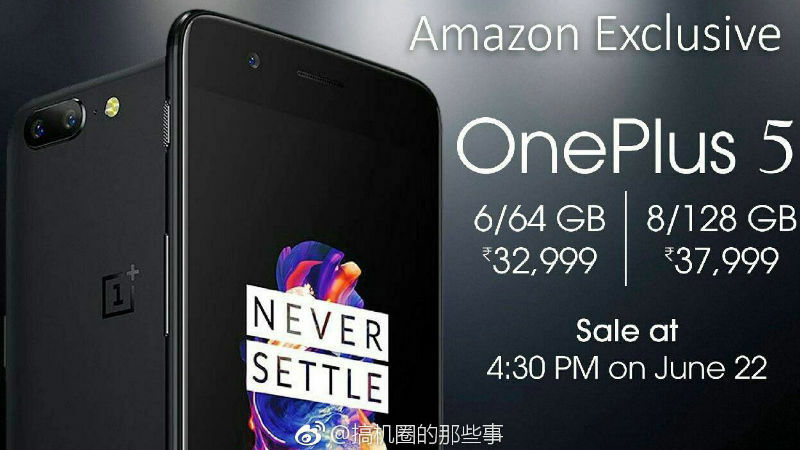 Registrations for the smartphone opened in China on June 14, and 5.27 lakh people signed up for the sale in five days. The OnePlus 5 India launch is on June 22, with pop-up events scheduled to be hosted in New Delhi, Mumbai, Chennai, and Bengaluru over the next two days. At these pop-up events, fans will be able to experience the device and will have the option to purchase it on the spot, though number of units available will be low. Amazon India is also hosting an app-only 'Secret Doors' contest that provides fans a chance to win the OnePlus 5. The OnePlus 5 price in India has been tipped more than once in the recent past, with a seeming consensus of Rs. 32,999 for the 6GB RAM/ 64GB inbuilt storage variant, and Rs. 37,999 for the 8GB RAM/ 128GB inbuilt storage variant. As for the OnePlus 5 India launch, it's scheduled to happen at 2pm IST on Thursday, June 22, at an event in Mumbai. While it's officially been confirmed to be an Amazon India exclusive, it's also to go on sale at 4:30pm the same day. Both EU and US pricing of the smartphone have also been tipped, said to be EUR 550 (roughly Rs. 39,900) and $479 (roughly Rs. 30,800) respectively, thought to correspond to the 128GB and 64GB variants. As for the OnePlus 5 specifications, the company has confirmed a few things itself. It will be powered by the Qualcomm Snapdragon 835 SoC - while Amazon India's source code gave a top clock speed of 2.3GHz. The company also says it will sport a camera built in partnership with DxO, and a horizontal dual camera setup has also been confirmed. The smartphone is said to include a 5.5-inch full-HD (1080x1920 pixels) display - though a QHD display has also been rumoured in the past - with a range of DCI-P3 colours to ensure colour accuracy. As we've already mentioned, 6GB and 8GB of RAM variants are expected, with their corresponding 64GB and 128GB inbuilt storage options. In terms of optics, OnePlus 5 will sport a dual camera setup at the back that has a 20-megapixel sensor with f/2.6 aperture and a 16-megapixel sensor with f/1.7 aperture. At front, the smartphone has been tipped to come with a 16-megapixel sensor. The company told The Verge that it doesn't have the resources to develop bezel-less phones, and thus directed its efforts on building a camera that rivals the best in the industry. The company says the OnePlus 5 camera is "the highest resolution dual-camera system on a smartphone today." There's a portrait mode, and software is the reason behind 80 percent of the success it has achieved in the optics. OnePlus 5 has been tipped to house a 3300mAh battery and come with NFC and Bluetooth 5.0 support as well. In a series of tweets, the global Twitter handle of OnePlus has teased few more features like "always connected", which could be a hint at dual-SIM support on the smartphone. In another tweet, the company teased improved Dash Charge capabilities of the OnePlus 5. It wrote, "charging ahead." The company itself has confirmed the OnePlus 5 design, and it appears to to be similar to that of iPhone 7 Plus, with the same horizontal dual rear camera setup to boot. It's also been confirmed to sport front-facing fingerprint sensor. OnePlus has also called it the "slimmest flagship smartphone" from the company. In yet another tweet, the company again teased the phone's dual camera capability. 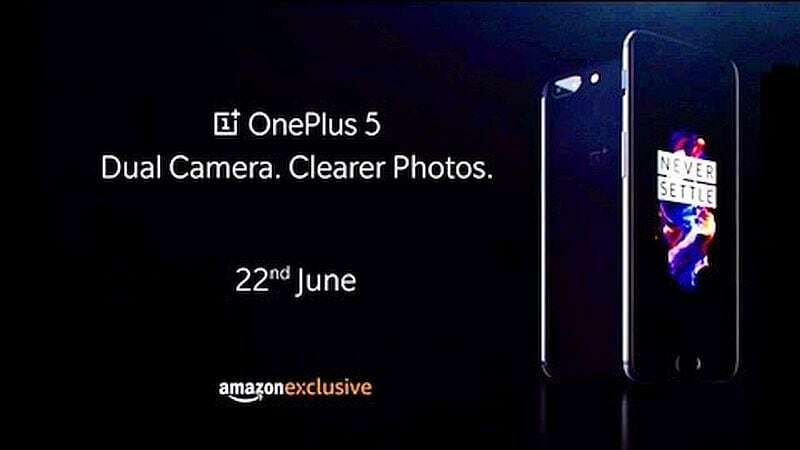 Carl Pei, OnePlus Co-founder, also teased bokeh effect in an image said to be clicked with the upcoming flagship. Pretty much the entire design was revealed during a TV ad. Days ahead of the launch, the company released a YouTube video that focussed on the customer service fans can look forward to when buying the OnePlus 5. The video, that has been viewed 3.8 million times so far, claims customer satisfaction of OnePlus buyers is 86 percent, and Net Promoter score of 74 percent. Other consumer-centric services provided by the company include free pick up and drop facility, one-hour quick repair, and the provision to check cost of parts on the official website, among others.